The Paulick Report in once again pleased to offer a special print publication available here and on the grounds at the Keeneland January Horses of All Ages Sale in Lexington, Ky. In this edition of the PR Special, Natalie Voss shares attitudes and perspectives from trainers in Great Britain about the use of medication. 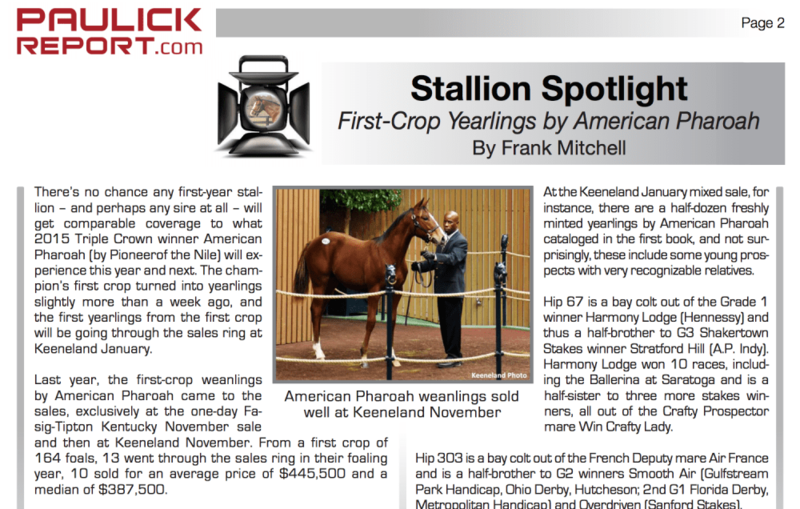 Frank Mitchell turns his Stallion Spotlight on American Pharoah's first crop of yearlings and suggests a few hip numbers to keep an eye on at the sale with Five To Watch. Our Honor Roll looks at the career of Keeneland January grad and multiple Grade 1 winner Practical Joke. Plus, Dr. Dale Brown answers a question about equine vaccines in Ask Your Veterinarian. This entry was posted in PR Special, Ray's Paddock and tagged american pharoah, horse racing medication, keeneland january sale, lasix, PR special, practical joke, Thoroughbred Auctions, thoroughbred sales by Paulick Report Staff. Bookmark the permalink.